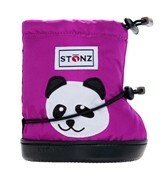 The original versatile Stonz Booties, available for newborns through 2.5 year-olds. Winter boots for babies that stay on! 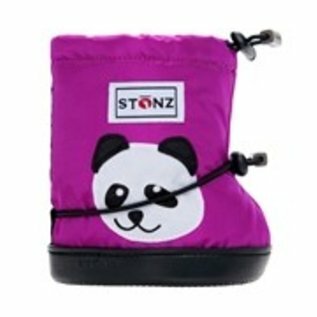 Stonz booties can be worn over bare-feet, socks, slippers or shoes throughout Fall and Spring. For snowy winter weather, layer up with a pair of Stonz Sherpa-fleece Linerz ($18 - sold separately). Durable coated nylon upper provides wind and water-resistance. Fleece lining provides warmth and comfort. Wide opening designed to slip on easily. Two adjustable toggles at calf and ankle provide custom fit and ensure Booties stay on! Rubberized, skid-resistant soft soles. Machine wash and dry, inside out on delicate cycle. Canadian Podiatric Medical Association Seal of Approval.